What were marshmallows used for before roasting over a campfire? Were they cushioning for shipping breakable objects? Were they used inside pillows? I don’t get it. Obviously they were used during wartime, before napalm was invented. Marshmallows would explode and leave fiery goo that stuck to all surfaces. Until one day a brave soldier tasted it and exclaimed, “Mmm!” After that, their use as weaponry became futile as they were met with enthusiasm by opposing armies. 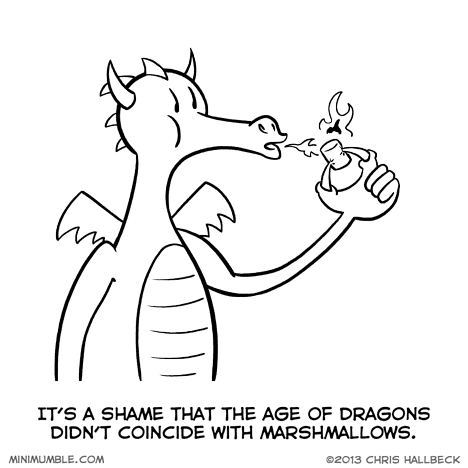 I’d be surprised if dragons never saw marshmallows, as Iceland has had an abundance of both. But I guess maybe dragons went into hiding before marshmallows became a chief export of Iceland (image search for “Iceland marshmallow farms”). The first part of your post is made much funnier by the fact that I’ve seen a guy try to eat a marshmallow that was still on fire. He wasn’t the brightest of guys… The heat actually made his tongue start bleeding like crazy. Today’s marshmallows are actually imitation marshmallows. Marsh-mallow is a plant. Before candy marshmallows were invented people used to peel the roots of actual marsh mallow plants and roast them. They are sweet and sort of gummy. Marshmallow root tea is good for a sore throat. So, roasting marshmallows over a fire predates modern marshmallows. More importantly, they were long gone befroe the invention of chocolate bars and graham crckers, as well.